The Board of Governors is the senior governing body of Concordia University and is responsible for establishing the legal and administrative framework of the university. In 1973, the initial composition of the Board of Governors was the product of the revision and amendment of the Sir George Williams University (SGWU) charter to include representatives of both SGWU and Loyola College in the context of their merger for creating a new university. On August 10th 1973, the Corporation of SGWU adopted Special By-Law “C” which enacted a change of name to CONCORDIA UNIVERSITY– UNIVERSITÉ CONCORDIA. By-Law “D” was also adopted, which established the governing and administrative structure of the new university. The meeting was adjourned. A new meeting was convened the same day at which corporation and board members resigned and elections were held for new members of the Corporation and of the Board of Governors, in conformity with the revised new structure. During the election which followed, Dr. John W. O’Brien was appointed Rector and Vice-Chancellor and Father Patrick G. Malone was appointed Vice-Rector and Principal of Loyola Campus. At its next meeting, on September 6th 1973, the Board of Governors approved the membership of six associated committees and the constitution of the University Senate. The new university received its legal and official establishment from the Quebec Government only a year later, in August 1974. 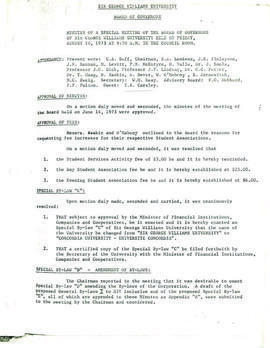 Meanwhile, the meeting minutes of the Board of Governors and its associated committees were, most of the time, identified as those of “SGWU (to be known as Concordia University)”. The fonds documents Concordia University’s management and decision making. It mainly consists of meeting minutes (open and closed) and supporting documents of the Board of Governors and its associated committees. The documents were transferred to Records Management and Archives by the Board and Senate Administration. Access to the minutes of closed sessions of the Board of Governors is restricted. In accordance with the University Records Classification and Retention Plan, further accruals are expected on a regular basis.